My Name Is IRL: Danica's car has been "found"
Danica's car has been "found"
While Curt Cavin's phone gently tweets from the airport for the presumed conclusion of the AGR viral marketing campaign, this press release just starter showing on the wires. INDIANAPOLIS - (Business Wire) Boost Mobile, the prepaid division of Sprint Nextel (NYSE:S) that redefines value for prepaid wireless consumers, and Motorola, Inc. (NYSE:MOT) today unleashed the new paint scheme for Danica Patrick’s lucky #7 car with the announcement of a Boost Mobile sponsorship. 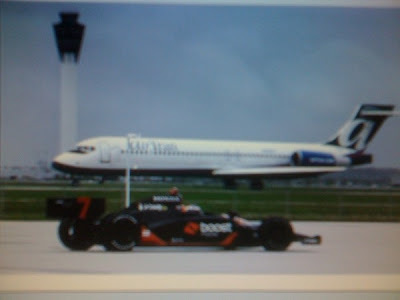 Patrick unveiled the new IndyCar design today by driving it down the tarmac at the Indianapolis International Airport. For the remainder of the 2009 IndyCar Series season, Patrick will sport a jet-black Boost Mobile/Motorola/Andretti Green IndyCar with eye-catching, electric orange accents. Meanwhile, the intrepid one tells us "Car is black with orange. Same style as before, different colors." The livery of My Name Is IRL? Color me flattered! Pics will be posted as soon as they become available. UPDATE: Well, it's about as clear as the Zapruder film, but here's the first pic of the new paint scheme. Thanks to reader Joe for the pic. And here's another. And another. And a whole bunch more. Or is the paint scheme patterned after Goldfish and Clowns? And do I wait to see if Hot Wheels makes the new scheme in diecast? Now that Helio's back they need to do another production run of cars anyway. BOOST Mobile used to have those adverts with the tagline: WHERE YOU AT??? As of 12:18... Where DA PHOTOS (of her car) at??? Oops. Link didn't work the first time. Oh, my. There is so much potential there in that quote. "Boost Mobile! When a hand puppet show just isn't getting your point across." "Got something to say to somebody, but they're waaaaaaayyyy down pitlane? Boost Mobile!" Oh I get it now... those dudes BOOSTED Danica's ride to apply the new Boost Mobile livery. This stunt summed up in one word : GAG ! Perhaps you should just say MarcoFan26??? You don't seem to pay attention to the rest of AGR!!! I seem to remember your boy (Marco) running a special scheme @ Kansas (Venom Energy Drink) & Tony Kanaan ran Dr. Pepper colors @ Long Beach. You right... they are dissin' Hideki Mutoh !!!! Where the F**K is my Japanese bro's special scheme??? Danica , Tony & Marco... they get all the special schemes... WTF??? AZZO45-My point was AGR never went to this much trouble ie.-taping a mock theft & racing a freakin airplane-for ANY of the other 3 drivers, Hideki included. Yes I'm a Marco fan, but I also support TK & Hideki. I'd much rather see this done for TK who deserves the attention who busts his a** for this team. Orange and black? Why them's CHAMP CAR colors! AGRfan26: Motorola is at the end of a 27 MILLION dollar deal & with including Boost Mobile its probably continuing... HTF is this "bad"??? At least Motorola actually views their IRL involvement as legit & worth marketing around. Call me when Newman-Haas is called by their sponsor to promote Happy Meals, eh??? I read this whole thing a little differently, I guess. The Boost thing is for the rest of the year, not just Indy. Motorola is tanking badly, very badly, and their continued business viability may be in question. AGR already has the Motorola money through the 3rd year. I see it as Motorola selling the balance of the sponsorship year to Boost Mobile. Boost Mobile pays Motorola for the balance that Motorola has already expended for this final year, and Boost gets the big promo on the car. Motorola gets little logos on the car, plus the balance of their money back, making it seem that they're still directly involved. The question will still be, what will happen next year? IMHO, Motorola is totally out, Boost will decide whether or not to continue after this year, and if they do, again IMHO, you will not see any more 3 year $ 27 M deals. By the way, I was in our local Best Buy, Office Max, and Staples stores today, and none of them had anything to do with Boost Mobile in their stores. Guess we're not in the right demographic here. A new paint job is news at Indy? Mr. Hulman would be appalled at what passes for Indy 500 news nowadays. Mr Hulman wouldn't have wussed out & posted anonymously either! From what I've read I think Mr Hulman would have been more appalled that there were so many women entered in his race than he would be at any attention paid to their paint schemes. Then again, none of us have ever been Tony Hulman, so nevermind. Was Janet Guthrie before Mr. Hulman's demise??? Was Janet Guthrie before Mr. Hulman's demise?? ?Yes she was. She passed her rookie test in 1976 but failed to make the race. In 1977 she became the first woman to qualify for the Indy 500. Tony Hulman passed away of cancer in the fall of 1977. Mr. Hulman's feelings on having Janet qualify were expressed in the tortured starting command for the 1977 500 that went something like "In the company of the first woman to qualify for the Indianapolis 500, Gentlemen Start Your Engines!" I now fear for the English language. Please take the survey below and persuade me I haven't gone bonkers!